Get together with fellow teachers for an afternoon of fun and creativity! We will be making three excellent make and take projects. 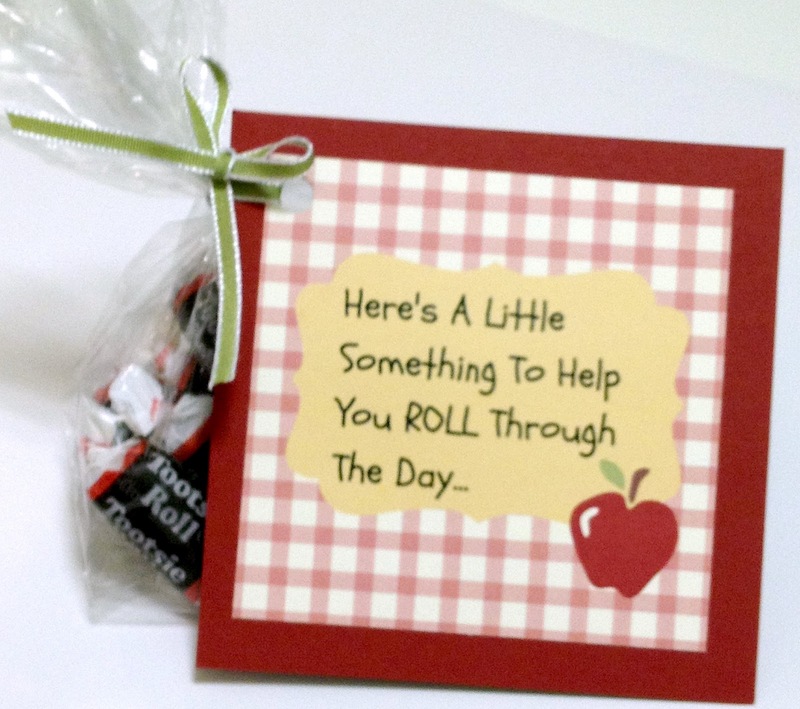 Each project would be a great gift for your students, the teacher in the classroom next door, or keep it for yourself! 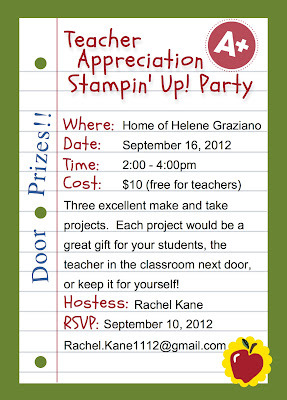 The fee for this event is waived for teachers because we want to show our appreciation for you!! Not a teacher but have a friend who is...bring her along and the party is free to you too! Your hostess will be Rachel Kane (kindergarten teacher). Please RSVP to Rachel at Rachel.Kane1112@gmail.com no later than September 10, 2012. Hope to see you there! P.S. directions to the party will be provided via email once RSVP is received. Discounted Stampin' Up! Products Just $.99! WHILE SUPPLIES LAST the following discontinued Designer Fabrics from the 2011-2012 Idea Book & Catalog will be available at the low, low price of just 99 cents. No limit on quantity. Click HERE to order Stampin' Up! products 24/7. So you've been trying out your free 30-day trial of My Digital Studio and there's no doubt that you're loving it! Well, here's another thing you're going to love...30 downloads and 1 content disc (Yup, that equals 31) all 31% off through August 31st. Contact Me for a complete list of digital content on sale till August 31st. My Digital Studio 30-Day Free Trial! Just click HERE ...then click the "Shop Now" button in the upper right hand corner. Follow the directions to create a customer account (or sign in if you already have an account.) Once you have an account just enter product number 130910. You'll receive a link to download the program. That's it...Have Fun! And remember, you can always CONTACT ME if you have any questions. Halloween, Thanksgiving, Christmas, Hanukkah, it's all here. The Holiday Catalog has arrived and I just love what you can create with all the new holiday stamps and coordinating supplies. And the best part, Stampin' Up! now bundles coordinating products together for a discount! Whether you're creating cards, gifts, scrapbook pages, invitations or home décor, it's all here. Choose from several different bundles and save money at the same time! Rather create digital projects...take a look at the Holiday downloads for My Digital Studio! 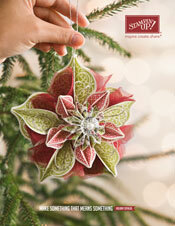 Click the image of the Holiday Catalog and download your catalog now. Then click HERE to shop online 24/7.